Luis Carlos Montalván is a 17-year veteran and former U.S. Army captain who earned the Combat Action Badge, two Bronze Stars and the Purple Heart. His tours in Iraq also left him with post-traumatic stress disorder (PTSD) and traumatic brain injury (TBI). Luis shared his story of the “war after the war” at the Invisible Disabilities Association’s (IDA) annual awards banquet, held October 2, 2011, in Lone Tree, Colo.
Allsup was a sponsor of the event, which is held each October during Disability Awareness Month. The awards banquet honored individuals and organizations making positive contributions to understanding and treating invisible disabilities. Millions of Americans have unseen but debilitating chronic physical and mental conditions. These include TBI, PTSD, affective disorders, diabetes, cancer, lupus, Crohn’s disease and fibromyalgia. In addition to enduring life-altering symptoms, many people with invisible disabilities must deal with critical judgments, lack of understanding and discrimination. Evidence of this was alarmingly clear at the hotel where the banquet was held, when an employee initially refused to allow Montalván’s service dog, a golden retriever named Tuesday, onto the premises. Among other things, Tuesday helps Montalván with balance issues caused by TBI, helps ease anxiety from PTSD and reminds him to take medicine. The ADA gives civil rights protections to individuals with disabilities and requires equal access to employment, transportation, public accommodations, public services and telecommunications. The ADA calls for state and local governments, businesses and nonprofit organizations that serve the public, to allow service animals to accompany people with disabilities in all areas of the facility where the public is normally allowed to go. “I’m an advocate, not an activist,” Montalván said. In addition to a letter of apology, Montalván asked that the entire [hotel chain] train their employees on the requirements of the ADA. After getting a crash course on the ADA, hotel staff welcomed Tuesday and the other service dogs in attendance. That spirit of advocacy and perseverance was demonstrated throughout the evening as individuals and businesses were honored for breakthrough research, volunteerism, corporate responsibility and innovation in meeting the needs and raising awareness of those with invisible disabilities. Connell said IDA offers individuals support, understanding and the comfort of knowing they are not alone. Like Capt. Montalván, IDA educates and raises awareness of the realities of invisible disabilities to shatter myths and increase understanding. To download a poster in observance of National Disability Awareness month, click here. The Invisible Disabilities Association is a 501(c)3 non-profit organization based in Parker, Colo., which encourages, educates and connects people and organizations touched by illness, pain and injury around the globe through its website, online social network, literature, projects and seminars. For more information, visit www.invisibledisabilities.org. For more information and to receive a FREE consultation visit Allsup.com. [EDITOR’S NOTE: The Marriott Hotel was notified of the arrival of Service Dogs prior to the event and other service dogs were checked in without question. The Marriott Hotel issued a verbal apology immediately and a formal letter was sent to Captain Montalván. The Invisible Disabilities Association also had the opportunity to give a presentation to hotel management and staff, providing education regarding Service Dog and other accessibility laws and other accommodations]. Allsup, Inc. Allsup Place. 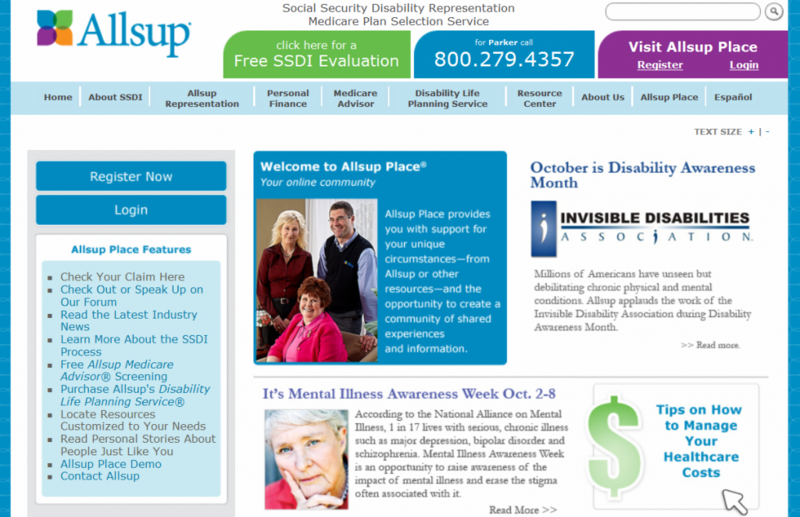 Allsup Applauds Work of Invisible Disability Association. October 2011.